CSNNW’s Blazers beat reporter Jason Quick (who formerly worked with Canzano at the Oregonian) noted that Canzano never spent any time in the Blazers locker room during the season. 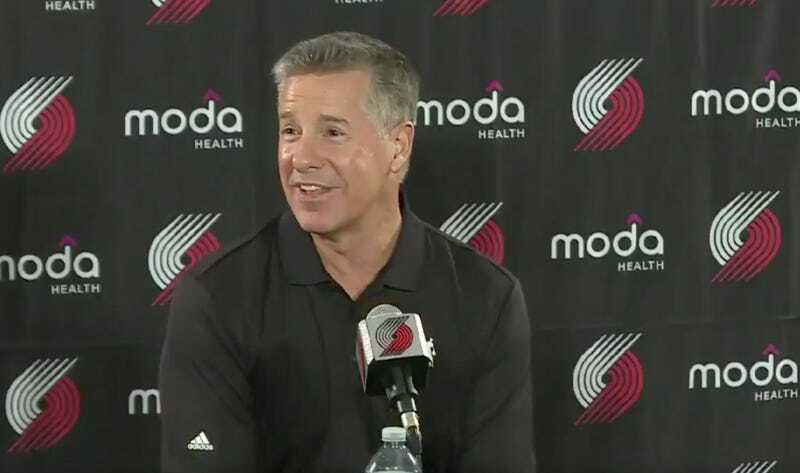 And when Olshey was asked obtusely about the column today, he immediately broke into laughter at the mention of culture, and responded that Canzano only attended two games all season. He then proceeded to roast Canzano, and accused him of merely using his press credential to get photos of Steph Curry. Canzano defended the column earlier today in characteristically confounding fashion. Good newspaper columnists bring history and perspective to their columns, and should absolutely blast organizations, owners, and executives that deserve it. If you want to criticize Olshey, there is plenty of ammunition, beginning with the contracts handed out this offseason to Allen Crabbe, Moe Harkless, Evan Turner, Meyers Leonard, and Festus Ezeli. Canzano even briefly mentions some of these before pivoting—“But again, isn’t there a deeper, more troubling issue here?”—to the culture problems, the only evidence of which he can proffer is that Olshey sometimes isn’t nice, and the Warriors are. Culture matters, but talent matters a hell of a lot more (note that famous assholes like Kobe and Michael Jordan have won a million championships), and so it’s baffling why Canzano looked past the problem staring him straight in the face to whine about a culture he seemingly spent almost no time around.